Initially, we thought the motorcycle you see in these pages was going to be the Tornado 302. Now we hear that it is going to be called the 302 R. But the decals on the pre-production motorcycle that we rode said all kinds of other things. So this motorcycle could be called the Tornado 302. 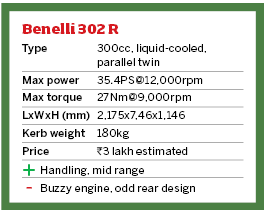 Or it could be called the 302 R. Or maybe it'll be the B302. Then again it could also be the 300 or the TXV. 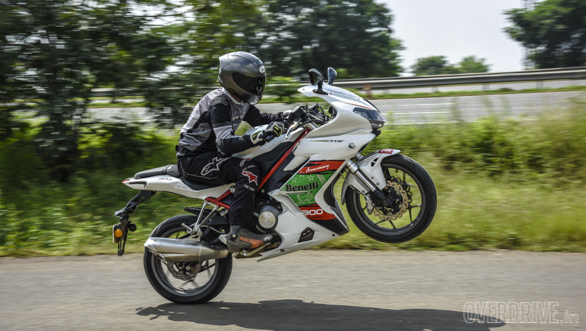 It could even be called the Anniversary or the Benelli Supermoto or even the BJ300GS-C. Or if we're really unfortunate, it could be called the Benelli Tornado B302 R BJ300GS-C TXV 300 Anniversary Supermoto. But we're sincerely hoping it's just called the 302 R. And in that spirit, that's the name we're going to stick to. But what is it, really? I'm tempted to say it is a TNT 300 with fairing slapped on. But I would be wrong. Because underneath that fairing is a motorcycle that is almost all-new. Why almost? 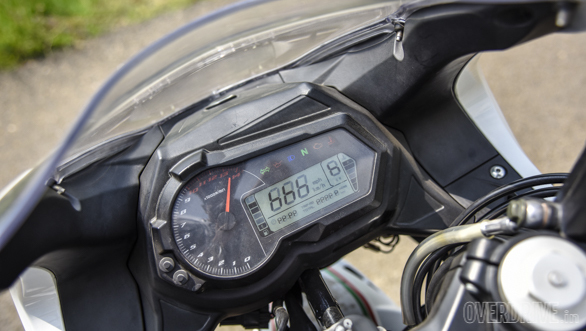 Well, aside from the engine and some odd bits and bobs here and there (like the instrument cluster), the motorcycle is all-new. But wait, let's start at the beginning. The most obvious change is that fairing. 302 R gets a handsome new face that is actually quite good-looking except for that eel stuck to the middle of its face just above the headlight. It isn't garish or anything. It just feels unnecessary on an otherwise well-executed design. The sides, for example, have lines that are clean and get inlets and outlets at all the right places, making for a very good-looking profile. The only other odd bit is the tail section that seems unnecessarily long and sticks out almost past the rear wheel. A lot like the ZMR in this area, then. The riding position also reminds you of the ZMR. It isn't aggressive but isn't completely upright either. But all this, you could have found out just by looking at it. What the pictures don't tell you is that underneath the fairing, the chassis and drivetrain have undergone some major changes. The chassis, for one, is all-new. Look closely and you will realise that it looks nothing the trellis used on the TNT. It is an all-new trellis with the engine as a more integral part of the whole chassis. This helps the 302 R have front to rear weight distribution of 50:50. Look closely and the offset rear shock has been replaced by a conventional unit. The swingarm, while still tubular, is a fresh design. The tucked away exhaust is gone and in its place is a new full-size unit that, I think, looks pretty rad. 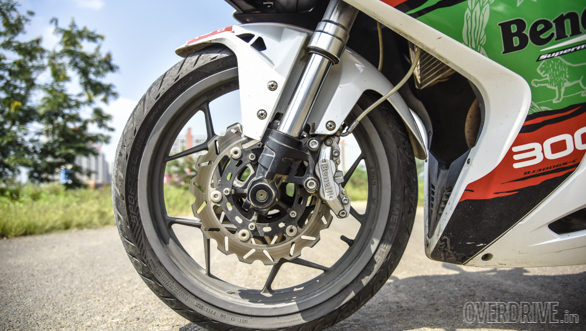 In fact, the only things that look like it came from the TNT are those upside-down front forks and that silver clutch cover with the embossed Benelli logo on it. Then again, that's because the engine remains pretty much unchanged. 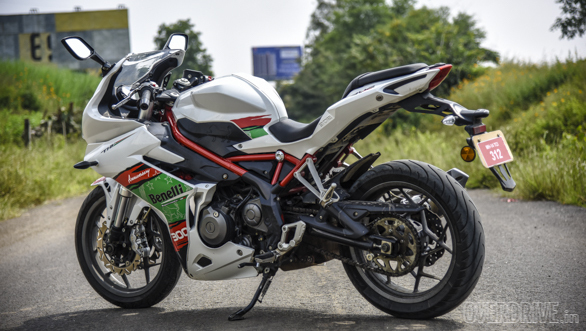 It is still the 300cc, fuel-injected, liquid-cooled parallel twin that we saw in the TNT. However, there are some changes. Firstly, the gear ratios have been altered to suit the fully faired nature of the 302 R. Secondly, the engine has also been retuned to match this new character - primarily a new engine map. 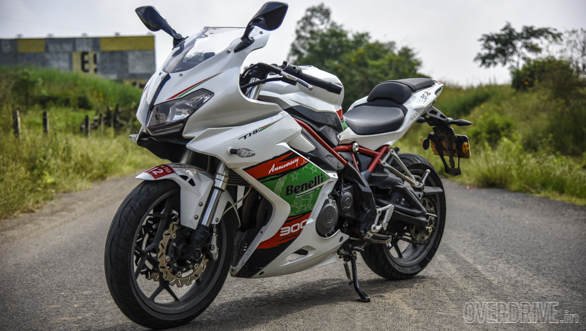 Since the motorcycle you see here is a pre-production version and the production version is still undergoing homologation, Benelli hasn't given us any power and torque figures. But we can make an educated guess that it will be just a smidgen lower than the 38PS and 26.5Nm of the TNT. 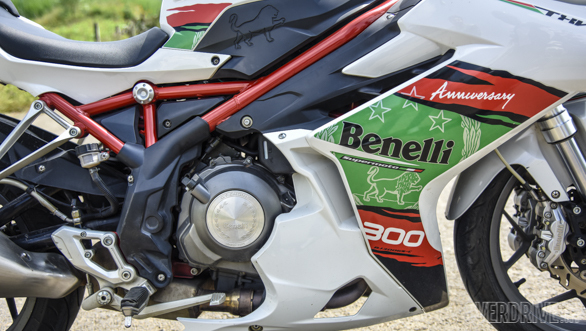 This because Benelli will most likely tune the motorcycle to be BS-4 compliant and lose some power in search of less emissions. In its pre-production form, the engine did not need to be revved high like the TNT to extract performance from it. The change in ratios seems to have improved things and delivers a little surge midway through the rev range. That said, don't go expecting a surge of acceleration like some of these Austrian motorcycles because that you won't find. 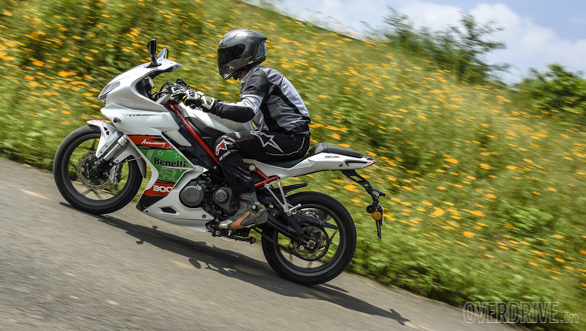 The 302 R does 150kmph without much strain, but it wasn't setting any records getting there. 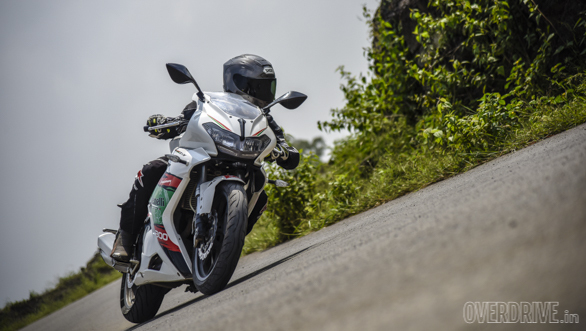 However, what I didn't like was the buzzing through the handlebars and footpegs and, at times, the seat right from idle till whichever rpm you were riding at. The buzz never went away. I'll make a note of it - this is a prototype - and see if our production-spec test bike is buzz-free or not. As I said before, the 302 R comes with upside forks at the front and a preload adjustable mono-shock set-up at the rear. The bike we had came with a Metzeler Sportec M5 at the front and a Michelin Pilot Street at the rear, again a pre-production speciality that will most likely become Metzelers at both ends. The rear suspension is all-new, and the front is set up differently in comparison to the TNT. It is a stiff set-up and this does make the ride a bit harsh. But the flip side is that it handles quite well. It turns in quickly and predictably. It also holds its line quite well through corners. 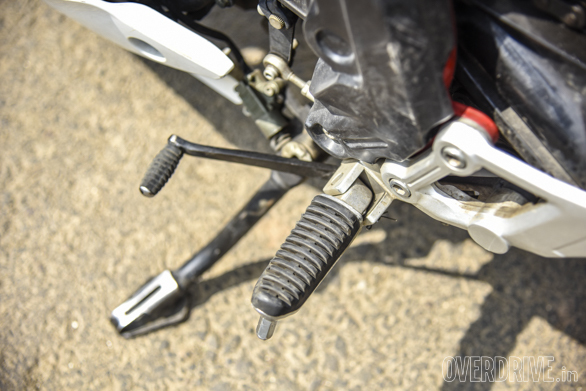 However, the feeler bolts on the footpegs (which aren't spring loaded, by the way) grind away before you're even close to the motorcycle's maximum lean capability. Looks like Benelli took the scraping silencer from the TNT away and replaced it with super conservative feeler bolts. Overall, the 302 R seems like a nice little motorcycle. It looks handsome, handles well and also manages to rid itself of the lack of mid-range grunt that was a big concern in the TNT. 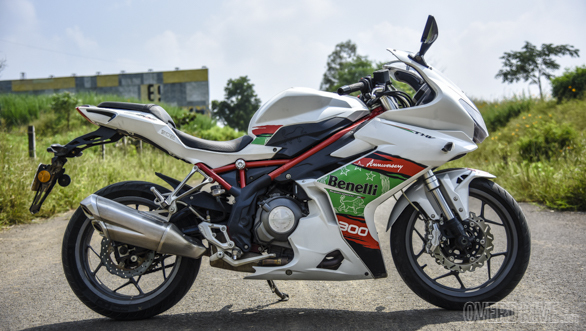 And when it does launch, most likely by December, Benelli should sort out all the little problems that we have noticed with the motorcycle. It will also get ABS. We expect it to be priced near the `3.2-3.5 lakh mark when it arrives.